Peter Lee & Rodney Thompson’s worker placement game in a Dungeons & Dragons city. Published in 2012 by Wizards of the Coast. Lords of Waterdeep is a featured game for 2019! Watch for event announcements. 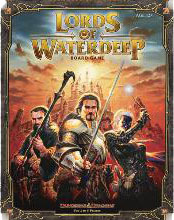 Lords of Waterdeep online play is through applications available for ios (iphone/ipad) devices.